The above info came from Tiff, and was edited by yours truly (contact me). The image came from Wikipedia. 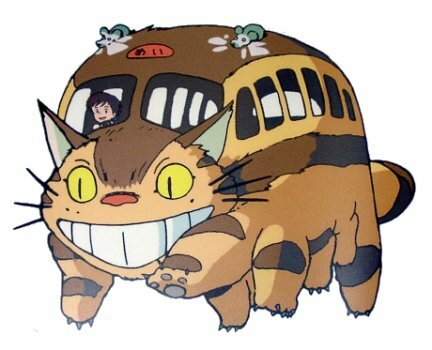 The Catbus appears two times in the Totoro movie. The first time is on a rainy day at a bus stop where O-Totoro is waiting for him with Satsuki and Mei, who are waiting for their dad. The second time the Catbus appears is when O-Totoro summons him to take Satsuki to Mei and he takes both of them to the hospital where their mom is staying. The above description came from Tiff, and was edited by yours truly (contact me).